How do you go back to a standing position when swimming in a prone position? What order do you bend your knees, bring your head out, push your arms back and put your feet down? Do they have to be done in a particular order or can they be done simultaneously? Getting back to a standing position whilst swimming requires a combination of movements, some of which are simultaneous. The first movements are the arm pulls down through the water and bending the knees forwards underneath the body. This movement is simultaneous so that the arms pull downward in order to assist the body movement upward and the leg movements downwards. The most common mistake is made when the swimmer attempts to stand by lifting their head and arching their back. This results in the legs remaining at or near the surface and the swimmer falling forward and failing to stand up. Imagine you are attempting to sit on a chair that has been placed behind you. You draw your knees forwards and pull your arms down to your sides at the same time. Then allow your upper body to raise out of the water as you place your feet on the pool floor. Standing up from breaststroke is easier than from front crawl as both arms are needed to help to stand and breaststroke constantly uses both arms simultaneously. From front crawl only one arm is usually out in front at any one time, therefore at the point of needing to stand up you should bring both arms out in front so that they can both help to pull your knees forwards. A clear and simple diagram showing how to stand up mid swim is shown below. Standing up mid swim is one of the most important and yet least taught elements of learning to swim. If you know you will be able to stop and stand up during your swim, then your overall swimming stroke will instantly become more relaxed, as you swim safe in the knowledge that you can stop and safely stand up whenever you need to. 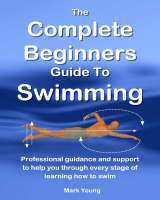 My ebook The Complete Beginners Guide To Swimming contains a chapter about stopping and standing up mid-swim, plus everything you need to know about relaxing and floating when learning to swim. Click the link below for more information. I am learning the breaststroke. I am 63yrs and have never swam before and I am having trouble standing up mid swim. Can you give me some tips please? Firstly well done on venturing into the swimming pool to learn to swim as there are many non-swimming adults that will not dare try! Breaststroke is the easiest to learn as an adult and learning to stop and stand up mid-way, especially when you become tired, is one of the most essential swimming basics. Standing from a prone (face down) position, or even a head up and facing forwards position, requires a simultaneous movement of the arms and legs. The arms pull down deep in the water, almost to your sides and at the same time your knees are drawn forwards and up. Your body almost takes on a sitting position just before you place your feet on the pool floor. If you are familiar with performing a ‘crunch’ in the gym (laying on your back and bringing your knees to your chest to work your abdominal muscles) it is much like that movement but in a more upright position. The most common mistakes are failing to pull the knees forwards and instead arching the back in an attempt to stand. Also failing to pull down with the hands and arms, giving a feeling of falling forward is very common mistake. Sometimes the technique of standing up can be more difficult if you attempt to keep you head above the water. Putting your face in the water and performing the technique partially submerged can sometimes be easier and as you get used to it, you will be able to eventually perform it without getting your face wet. However you do it there are no points for style and technique when it comes to standing up so it does not really matter how you do it! Standing up from a prone position is explained with the aid of a diagram on a separate page of our site. Click here to see it. 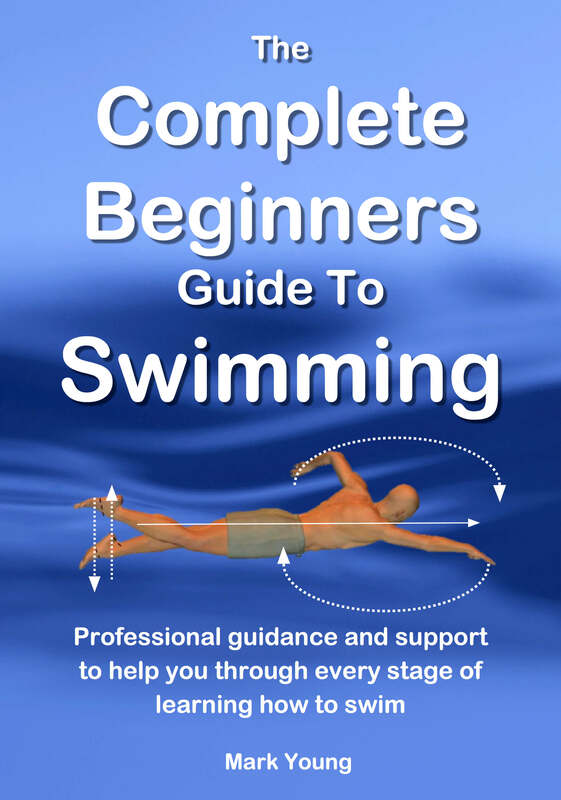 It is also explained along with loads of other useful swimming tips in my ebook The Complete Beginners Guide To Swimming. It contains all the help and support you need, from relaxing, floating and breathing to all the technique tips for learning to swim the four basic strokes Click the link below for more information. I am beginner learner of swimming, I have taken more than 20 lessons now and have a problem with STANDING UP in the pool after swimming my front crawl strokes. Please any tips or help advice or pictures step by step. Standing up in the pool requires a simultaneous movement of the arms and legs. From a prone (face down) position your hands have to pull directly down at the same time as bending your knees and drawing them up underneath your body. The trick then is to pretend you are attempting to sit on a chair that has been placed behind you. Bending the knees up underneath you will then encourage your body to almost sit up and it is at this point you can place your feet on the pool floor. Encouraging your body into an upright position makes placing your feet on the pool floor much easier. The most common mistakes are made when swimmers attempt to stand up by arching the back without moving the legs or bending the knees. The result is a battle with your legs as they fail to get to the pool floor.